Golden is known worldwide for it’s clear Rocky Mountain spring water and that may be just what you need to wash down the spicy dishes available at Golden’s many ethnic eateries. If you are in the mood to get spicy, look no farther than Golden. Here are a few of our favorite restaurants to enjoy international cuisine. Amir Grill- The atmosphere at Amir Grill will transform you from North Golden to the Middle East. Offering a wide variety of fresh, made to order dishes, including gyros, shawarma and our favorite, the hummus. Maki Sushi & Grill – Located in the heart of downtown, Maki Sushi & Grill offers fresh sushi and a variety of sushi rolls, as well as delicious teriyaki dishes, tempura and Thai dishes. New Peach Garden – You can find “extra hot” dishes as well as traditional delicious Chinese food at New Peach Garden. If you like authentic Chinese dishes, this is a must try. After all, where else can you find Chinese hamburgers – Rou Jia Mo? 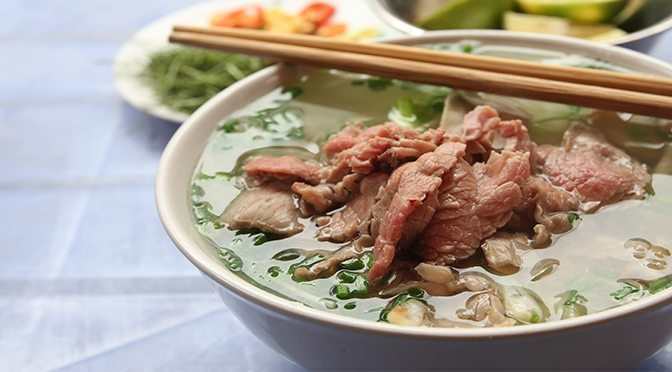 Pho Golden – Head to South Golden to experience one of the area’s first traditional Pho restaurants, where traditional Vietnamese entrees like Pho, stir fry, rice plates and more are masterfully prepared. Sherpa House Restaurant & Cultural Center – Located adjacent to the Foothills Art Center, the Sherpa House offers a full cultural immersion that goes beyond the authentic cuisine. The restaurant features interior décor that is an authentic representation of a typical Sherpa house in the Solu-Khumbu region of Nepal. The buffet lunch is a local’s favorite. Thai Gold – Enjoy traditional Thai cuisine in a historic building in the heart of Golden. The Pad Thai is fantastic and most of the dishes can be made Gluten-free. This is just an overview of the many fabulous spots in Golden to enjoy a delicious lunch. After your lunch, stroll along the Clear Creek walking paths and soak in the atmosphere of Golden!